I have recently picked up a couple of Promo CD's. Both of which appear to be quite rare as I haven't seen either on Ebay before. I would like to thank the GOOD PEOPLE at DECCA and UNIVERSAL for making it their business to get the promotional discs and press packs into the hands of charities like OXFAM. When OXFAM lists an item on E Bay you will see a little blue ribbon in the listing along with OXFAM's name in the sellers listing. It is helping others and I feel more inclined to overbid for these items because the "GREEDY PROFITEER" has been removed from the sale. I do hope Hayley and the other PROMO collectors are pleased with this arrangement as well..
That's interesting Comet. I've seen Oxfam items on Ebay, but I've never thought to look in charity shops as well. This is interesting. I don't normally look in charity shops either, but I might visit a few Oxfam shops this week. Careful Richard! You may come home with a new suit or a set of encyclopedias!! 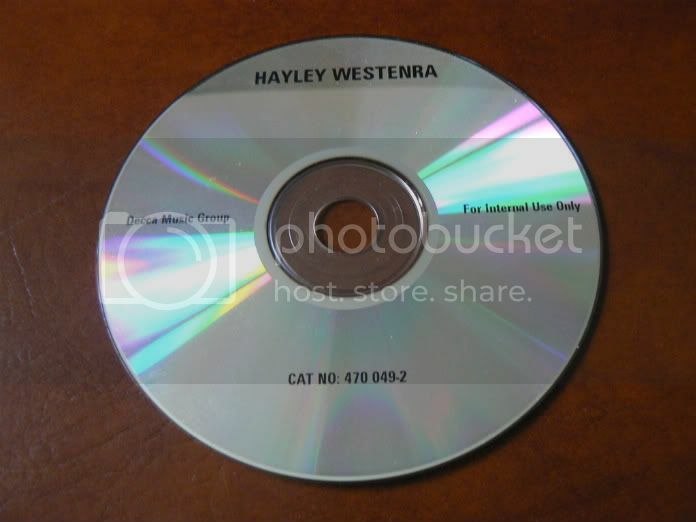 Can anyone supply any background information on the Hayley Westenra promo CD below. It came in a plastic slip case with the usual photo of Hayley on another insert , as well as the insert above. 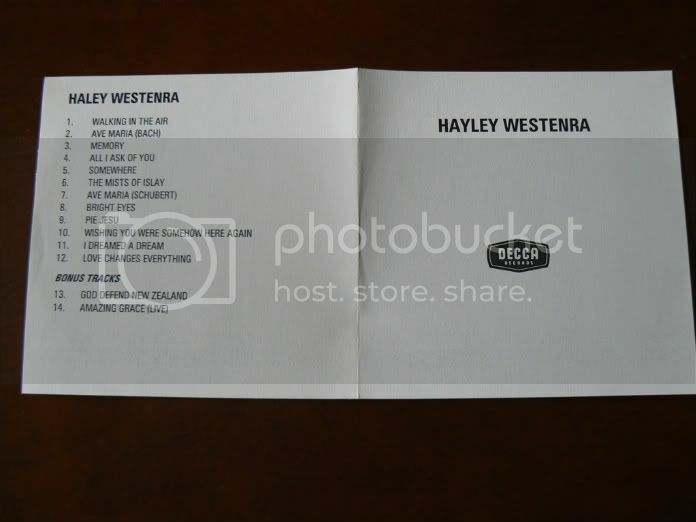 The track listing on this promo is identical to Hayley's first national release entitled "Hayley Westenra". I have never seen this promo before which suggests it may be very rare. The term 'For internal use only' is also unusual as the norm is to say 'for promotional use/purposes only. I would be interested to see a scan of the photo of Hayley as this should give some indication of release date. 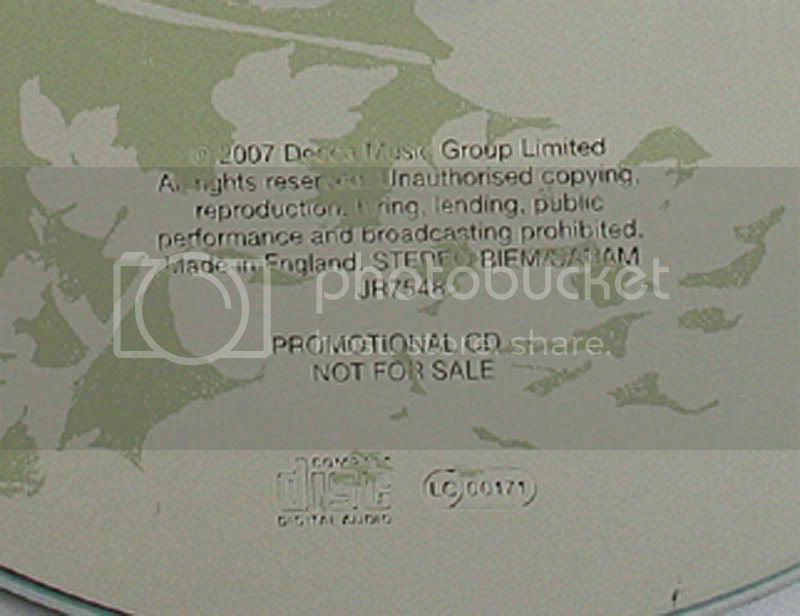 Promo discs with no photo and on CDR are quite common within the broadcast industry. These would be sent to radio and tv stations prior to the release of the album, often with the name of the local contact or promoter on a label on the envelope. That is a rare one , how long have you got it ? there is a good chance it originated in New Zealand where the album was first released on Universal Records. I have NEVER seen a promo for Hayley Westenra or My Gift to You. How about you Grant ? No Comet, I haven't. If any were ever issued I suspect they would be in very small numbers. What puzzles me is the reference to Decca and their Cat. No. Had it been branded as Universal, then I would have said "Yes, a New Zealand promo"
I have a few for Odyssey in that format... The name on the Wallet label is often of interest , but these are usually removed to protect the guilty..
Andrew, Steve or Joe may know more about these earlier promos. Would you like to swap it for a 'Walking In The Air' CD? We do know that Universal NZ were trying to interest Decca UK in Hayley before Costa Pilavachi first heard her - so my guess (and it's only a guess) is that this CD was ripped by Decca from an original NZ demo sent to them - and that it may have been one of several (or many) then produced by Decca to guage interest within the organisation. It may be one of these that Costa Pilavachi first heard - and we all know what happened after that. Hayleywowed! "For Internal Use only" implies to me that it was not a promo disc like those sent to outside organisations for, umm, promotional purposes - so yes, it may be a rarity. But what puzzles me most is that, if it was made by Decca UK for internal use, why was it allocated a Catalogue number? Perhaps it was indeed, as already suggested, considered for release in the UK... until Costa stepped in to stop it and to make room for bigger and better things? Interesting! It arrived today , so I am delighted it looks quite a find ! Looking forward to any more thoughts. That's the picture I hoped to see which sort of confirms it as a promo for Hayley's first national album (which we have never seen before!) The Decca label remains of interest and, as Dave seems to concur with my suggested possible reason for it, makes it not only potentially very rare, but also a piece of history that never happened!